Another fantastic adventure with twin brothers Gannon and Wyatt, this time in beautiful Hawaii. The twins rescue a drowning man, who urges them to hide a secret map for him. 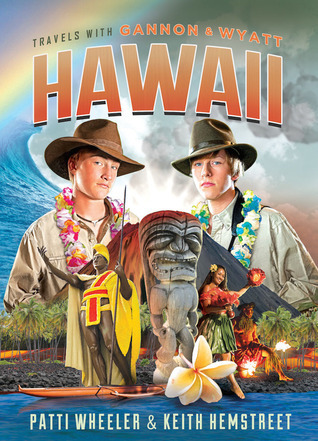 The map may contain clues to the ancient burial place of Hawaii’s King Kamehameha the Great, and Gannon and Wyatt set out on a treasure hunt to find it with the help of their guide, Alana. A mysterious archaeologist is also searching for King Kamehameha’s tomb, and is determined to take the map from the twins. Gannon and Wyatt survive a mountainous blizzard, explore a jungle, trek around lava flows, and delve deep into the culture and history of Hawaii. One of the great things about all these books is how Gannon and Wyatt show such a respect for native cultures. They truly love the countries they visit, and go through all these adventures to preserve cultural symbols and native habitats. It’s so refreshing to see them accepting and enjoying a new culture in every book. They learn some of the language, try native foods, learn some history, and give a picture of local life as they befriend people. The reader feels like they have truly experienced that culture, and it never slows down the plot, because it’s all woven together. I love the fast-paced action, the rich history, and the varied characters! I hope more Gannon and Wyatt books are written soon! Disclaimer: I received a copy of this book from the author in exchange for a free and honest review. All the opinions stated here are my own true thoughts and are not influenced by anyone.